This support helped CHAP provide art projects 37 hours a week. 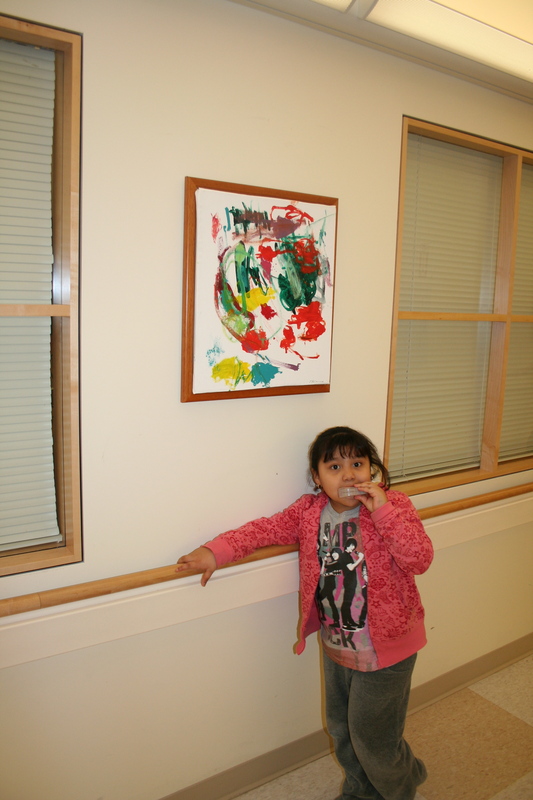 Including CHAPs first in-hospital art gallery called “10 South Art Exhibit” featuring 31 paintings from oncology patients and their families. 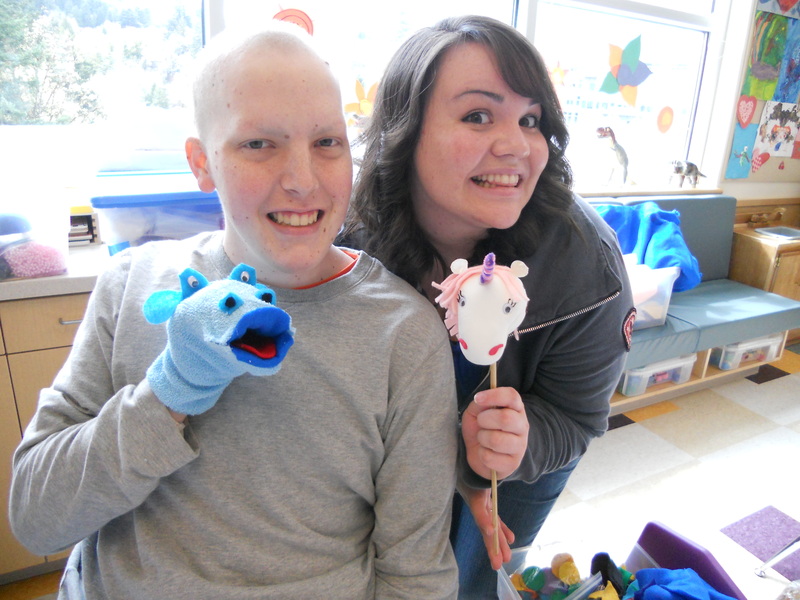 The oncology floor is on the 10th floor of Doernbecher’s Children’s Hospital (DCH). 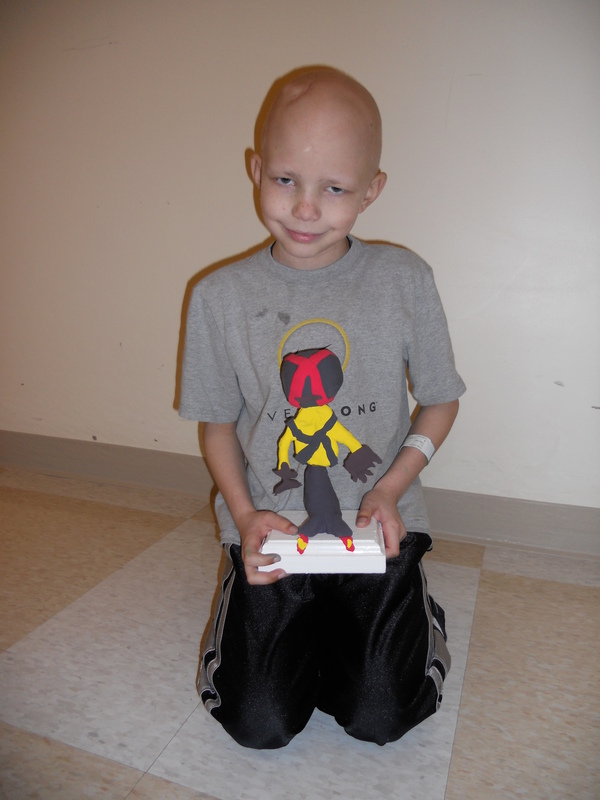 All CHAP kids at Doernbecher have the opportunity to CREATE THEIR OWN SUPERHEROS to express their dream to beat cancer! Feista of Spanish Horses – SPIRIT OF THE WEST RIDES FOR TEAM DUKE AGAIN! The Spirit of the West Riders got together to help man a display table at the Fiesta of the Spanish Horse, held this past May 7, at the Los Angeles Equestrian Center in Burbank, CA. 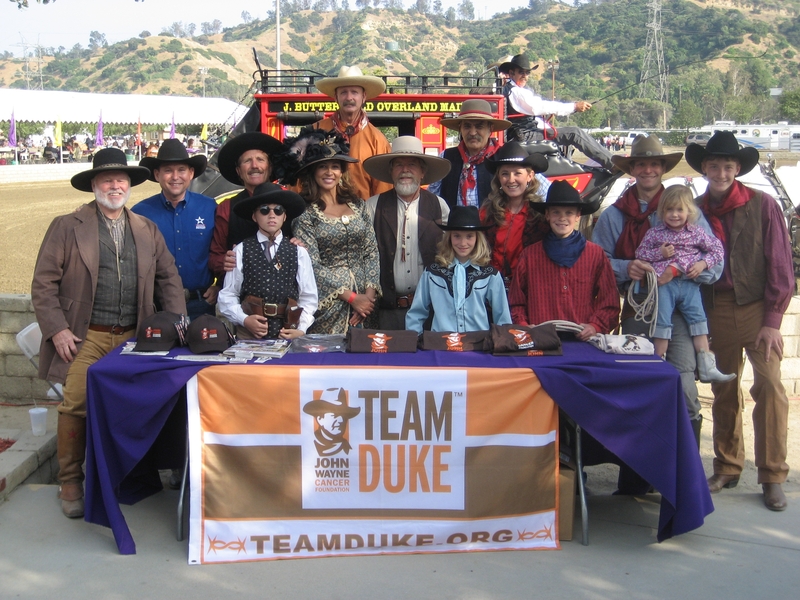 Colorfully outfitted, the group greeted visitors and entertained, while promoting awareness of the JWCF and Team Duke! 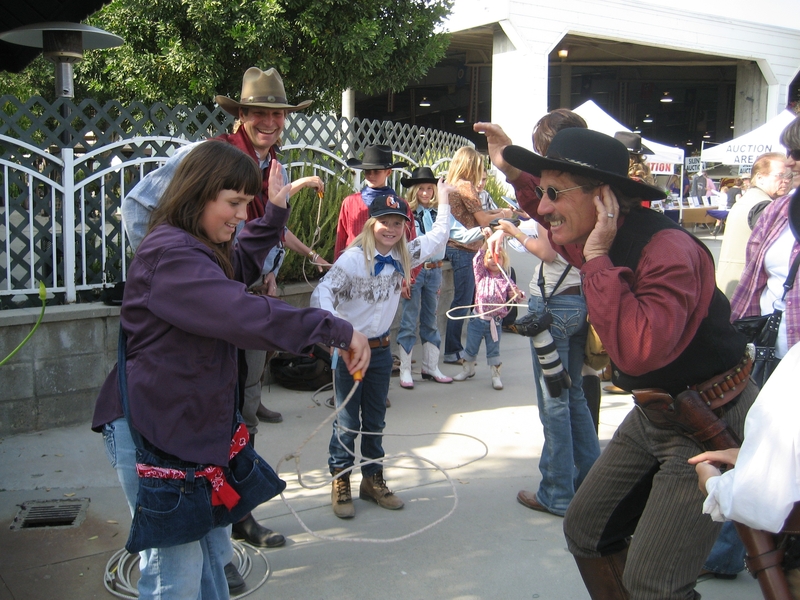 At right, Spirit of the West’s Greg Worley listens for the rousing “Yahoo!” Western cheer from a couple of young volunteer ropers, learning to twirl a lariat and earn a Team Duke shirt or hat, while Spirit’s Jay Lewis urges the kids on. The talented Lewis children are in the background performing and giving roping lessons to the eager onlookers. Spirit of the West’s Phil Spangenberger and Wendy Bailey, mounted on their matching gray horses, appeared as “Mr. 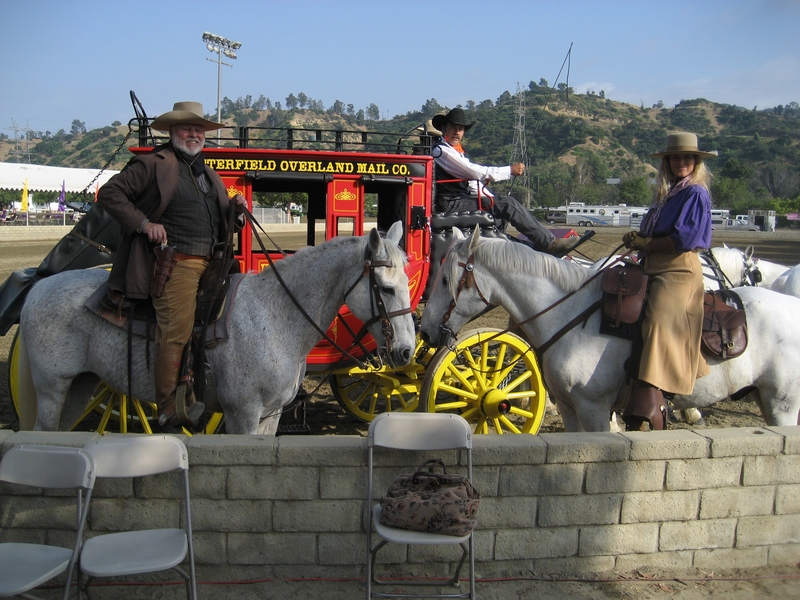 and Mrs. Outlaw,” in a fast-paced and humorous stagecoach holdup skit, assisted by coach driver Buddy Liblin, of G and F Carriages, who supplied this beautiful Concord coach to the Fiesta of the Spanish Horse. For the second year now, the Spirit of the West Riders made a colorful appearance as “Team Duke” at the recent Fiesta of the Spanish Horse equestrian extravaganza. The Spirit of the West Riders, who have been riding in the Rose Parade for the past 12 years on behalf of the John Wayne Cancer Foundation, joined forces for the second year to make a volunteer appearance at the May 7, Fiesta of the Spanish Horse equestrian gala. The event, produced by Asman & Associates, is an annual and extremely popular event that raises awareness in the fight against cancer, through the celebration of various breeds of Spanish horses and horse culture. The evening gala, that always packs the house at theLos AngelesEquestrianCenterinBurbank,California, features some of the world’s most beautiful horses and talented riders. Once again Producer Joanne Asman, generously offered a display table to the Spirit of the West group to promote the John Wayne Cancer Foundation, group marshal Phil Spangenberger, was happy to round up a posse of his riders together, to man the table and help out with the festivities. The members appeared dismounted, but in full, and very colorful Old West and traditional Western duds during the afternoon’s festivities before the evening’s equestrian performance, and served as greeters and provided entertainment outside of the arena. Fancy rope tricks and gun twirling demonstrations, performed by professional performers Christy Lewis and husband Jay, of Lewis Events, along with the little Lewis cowhands James (15) Brett (13) and Melinda (11) and even little two-year-old Emily twirled their ropes to awe the onlookers and attract visitors to the JWCF display. There JWCF tee shirts, ball caps, “Grit” removable tattoos, decals and other promotional material were given out. However, in order to obtain one of these coveted John Wayne items, the kids (of all ages) were required to spin a specially-prepared “spinning” lariat, thus earning the chance to select an item. Needless to say, everybody wanted a tee shirt or ball cap bearing the Duke’s image. Group Marshal Spangenberger, accompanied by Spirit of the West’s Wendy Bailey, entertained on horseback during the evening spectacle, by pulling off a galloping stagecoach chase and attempted robbery—but with a surprise comedic ending–where Phil, portraying sixgun wielding “Mr. Outlaw” is chased out of the arena by “Mrs. Outlaw,” played by Wendy, when she gallops in and chases her straying “hubby” home with her broom! Who says women don’t rule the roost—even the infamous robbers roost! Needless to say that between the thrilling equestrian performances and the Spirit of the West’s JWCF display of Team Duke, there’s a whole passel of new fans of the John Wayne Cancer Foundation! The Fire Road Cycling 2011event is an official fundraising event for the John Wayne Cancer Foundation (JWCF)/Team DUKE. The event is on Saturday July 9, 2011. 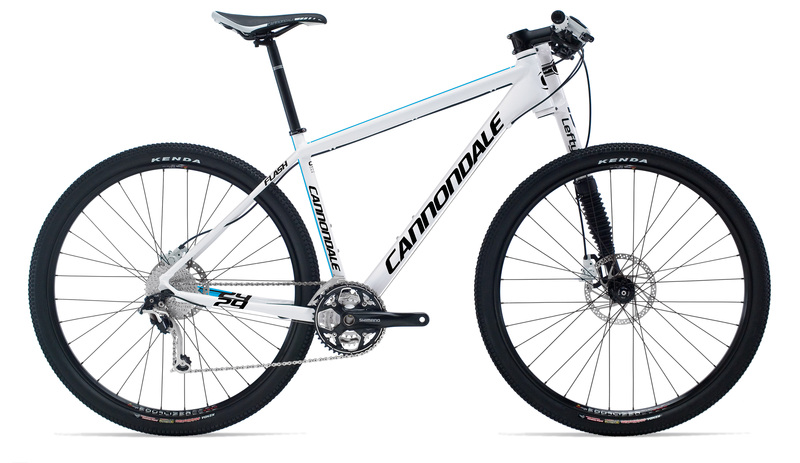 Win this Cannondale Flash 29er! The top fundraiser will win a Cannondale Flash 29er mtn. bike shown above (retail value $2,000). Timex Global Trainer GPS watch! 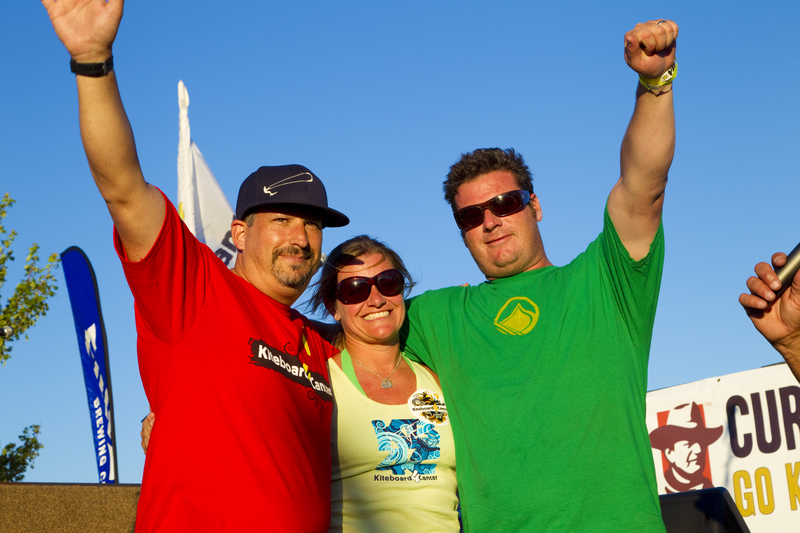 To join this fundraising contest contact JWCF’s Greg Graber at greg@jwcf.org or 949-631-8400. All contestants are required to contact Greg to enter this contest. JWCF staff Boots and Mandy have been working at two amazing support groups this week to help young adults fight cancer. Boots is working at the First Descents rock climbing camp in Moab Utah and Mandy is working at the Athletes for Cancer Maui Camp. 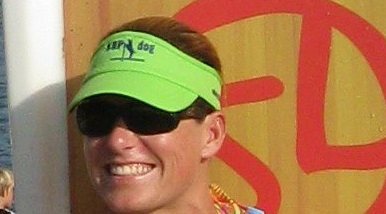 JWCF helped fund the inaugural Moab camp last year and Athletes for Cancer and Team DUKE have partnered to fund this first Athletes for Cancer camp. 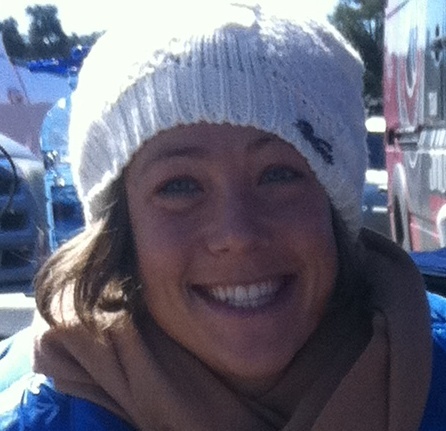 Thank you First Descents, Athletes for Cancer and Team DUKE for making these programs possible. 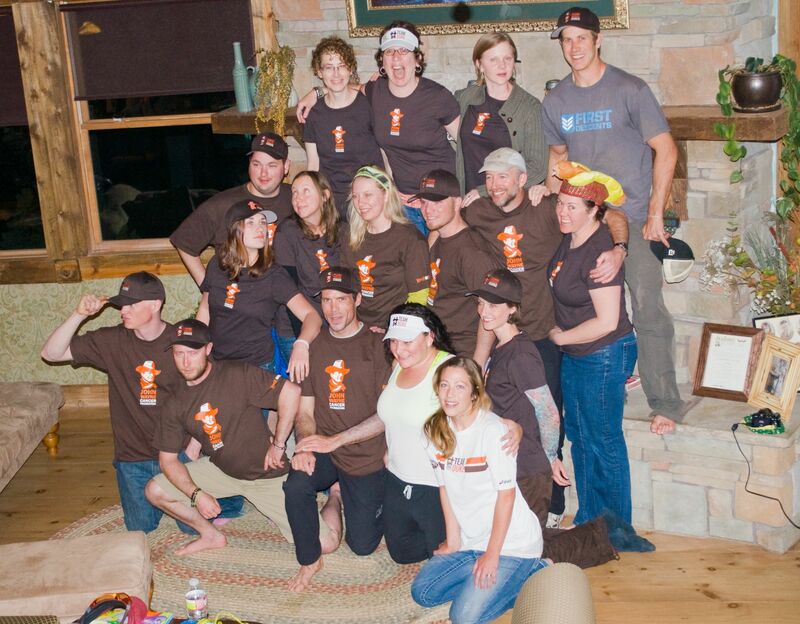 About the healing power of First Descent’s outdoor adventure cancer survivor support groups. 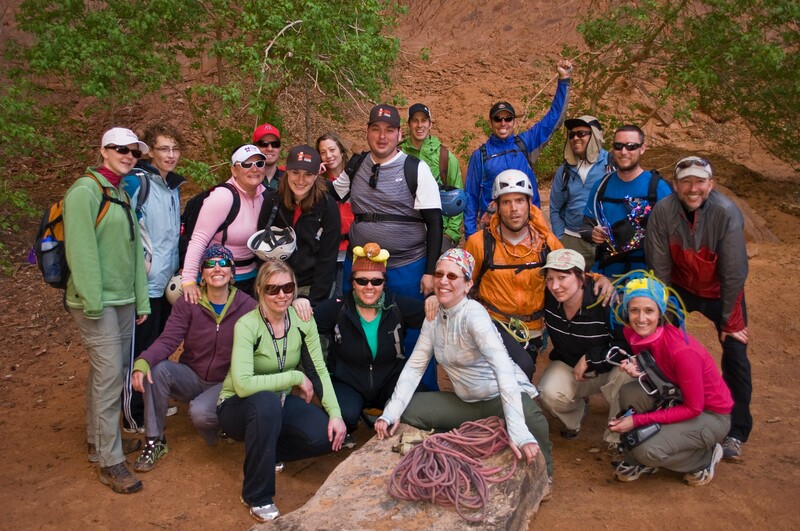 Lemon Drop attended the First Descents rock climbing camp in Moab Utah that JWCF supported. Click below for info. about this fun walking/running fundraising event in Arizona that benefits the Arizona Myeloma Network. JWCF partners with the Arizona Myeloma Network on an annual cancer conference in Arizona. 5K and 1 mile distances. Click here to go to the website to learn more and for registration link. 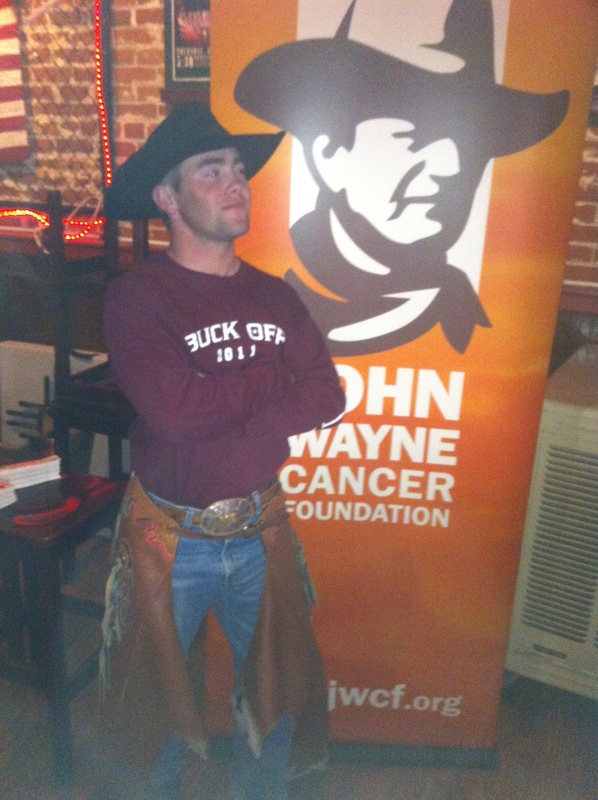 JWCF would like to thank Alpha Gamma Rho for fundraising at the AGR Buck Off in San Luis Obispo, CA.